The 2017 Dodge Journey is a mid-size crossover that provides a compelling price tag, substantial passenger space, and high-tech infotainment gear. Inside, the Journey delivers three roomy rows of seating and plenty of elbowroom for the entire family. High-tech gadgets, like the central Uconnect and rear-seat entertainment system, give the Journey a modern edge. Advanced safety gear maintains serious passenger protection. On the road, the Journey combines rugged power with a comfortable ride. Inside, the 2017 Dodge Journey offers an attractive design and quality materials. Upscale features, like heated leather seats, give you the VIP treatment on your way to work. Settle into any of the Journey’s three rows for extensive head- and legroom. The seat’s long-term passenger comfort and support makes the Journey a great pick for your next road trip. Throughout the cabin, passengers can stow carryon items in clever storage bins and cubbies. It’s easy to haul large cargo items home – simply fold down the rear seats to create 67.6 cubic feet of cargo space. 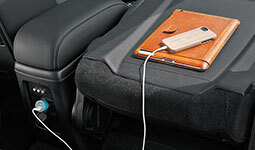 In addition to providing innovative comfort features, the Dodge Journey keeps you connected on the go. 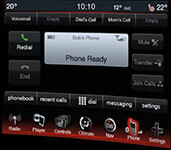 The central Uconnect infotainment system delivers extensive smartphone integration features, so you can send hands-free text messages and stream your favorite audio options. Use the Uconnect voice controls to access apps without looking away from traffic. With the turn-by-turn navigation feature, you can explore new territory without a hitch. The Journey’s LED interior lighting gives the cabin a soft glow after sunset. The in-dash DVD player comes in handy during long trips. The rear-seat entertainment system is a real people-pleaser. Its independent dual screens means passengers can choose two different entertainment options, including DVDs and video games. The Dodge Journey is all about passenger protection. In crash tests, the Insurance Institute for Highway Safety gave the Journey its top score of “Good.” Before you back up, the Journey’s rearview camera helps you spot any obstacles in your path. The second-row integrated child booster seats are great for families, saving plenty of installation time. Antilock disc brakes provide strong stopping power. An abundance of airbags, including side curtain airbags and a driver knee airbag, protects passengers from injury during a collision. Under the hood, the Journey combines potent power with modern fuel economy, earning up to 25 mpg on the highway. Choose all-wheel drive for enhanced traction on slick pavement or off-road trails. The suspension is tuned for impressive comfort, smoothing over broken pavement. At highway speeds, the cabin remains superbly quiet. For increased interior luxury and a performance boost, choose the Dodge Journey GT. This model comes with a sportier suspension for increased performance on-road and off. Inside, the cabin offers an appealing blend of upscale style and high-tech infotainment gear. The heated front seats and steering wheel take coziness to new heights. Plug your laptop into the 115-volt power outlet and stay busy on the go. The Journey supplies maximum traction when you need it most. Use the central touchscreen and voice-command technology to stay connected. The Dodge Journey treats passengers to an elegant ride. Inside the Journey, the Internet is always close at hand. The 2017 Dodge Journey is the perfect pick for modern families and outdoor adventurers alike. Inside, passengers enjoy three rows of spacious seating. The Journey also adds a layer of luxury, with features that include stylish leather upholstery and a rear-seat entertainment system. You’ll love the Journey’s powerful, fuel-efficient performance. Impressive crash-test scores and advanced safety gear provide peace of mind throughout your travels. Take the Journey on a test drive today!